We only source ECO-PURE non-irradiated Spirulina from the cleanest waters. So you can be certain you truly sre boosting detoxification and energy, instead of adding toxins back in. Follow these guidelines for maximum results: As a dietary supplement, six (6) capsules daily with meals (or as instructed by your healthcare professional). Warning: Do not exceed the recommended dose of 6 capsules per 24 hours. 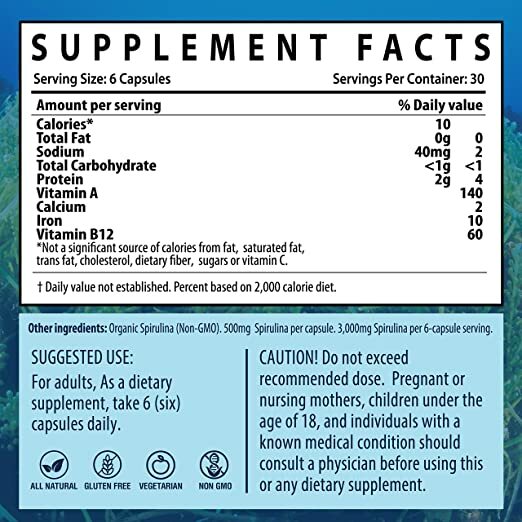 Please see your healthcare professional if you are pregnant or nursing, under the age of 18 or if you have a known medical condition before using this dietary supplement. For adults, as a dietary supplement, take one(1) serving per day(6 capsules) with a meal.